Can you name the 10 female vocalists above? 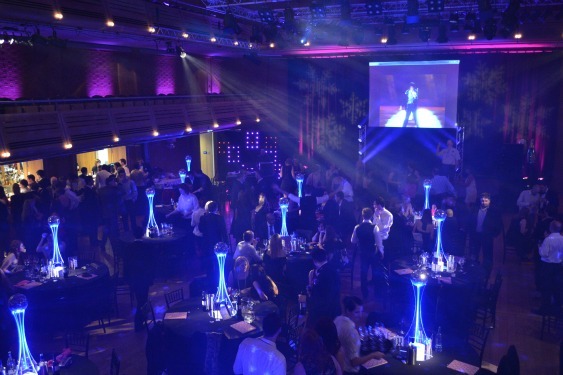 Corporate events are growing in popularity for businesses of all sizes in Manchester. Events provide a great opportunity to network with colleagues and clients, improve staff morale and build team connections. There are many different types of corporate events from casual social celebrations, to large and complex networking and training events. If you haven’t organized a corporate event before it can be a daunting task but one that can be tackled effectively once it is broken down into steps and delegated out. Are you holding an event as a networking event? An opportunity to get press coverage? A training day? As a way to show your staff they are appreciated and valued? The purpose of your event will impact on all other aspects of your planning so make sure that you are clear exactly what you want to achieve from the event. Setting an overall theme for your event can help a great deal with the overall planning and help you to decide on aspects such as venues, activities, entertainment and decorating. Some types of events lend themselves to themes more easily. For example, evening events that are focused around entertainment are often themed around Las Vegas casinos or Hollywood glamour. Your theme doesn’t have to be quite so literal though. If you’re simply planning a small training event, you may want to consider themes such as teamwork, leadership or creativity. It’s important to know how many people will attend your event before you can start planning. If your company is small, in most cases you won’t be organizing a huge corporate event, unless you plan to invite many guests. A large organization does not necessarily equate to a large-scale corporate event. It is often not necessary for every member of staff to attend and you’ll probably want to concentrate on a subset of your employees such as managers only or HR staff only, for example. The venue you choose will depend on the theme of your event and how many attendees you are anticipating. Whatever type of event you are planning, there are venues to suit every size and budget in Manchester. Hotels, conference centres, galleries, museums and sporting venues are all avenues to look into. For even the smallest corporate events, it would be a mistake to try and do everything yourself. Your event will truly be made by the activities and entertainment on offer, which may include external trainers, motivational speakers and entertainers. For social events, a good quality music system is a must. Floorfillas has provided DJ entertainment for many companies in the Manchester and Cheshire areas. As well as music and lighting, there are many additional extras which can be booked such as the Video Jukebox system, which is perfect for training presentations and award ceremonies. If you don’t know where to start, there are professional event planners available who can do all the hard work for you. You are also welcome to contact Floorfillas about your ideas. We have provided entertainment for many corporate events across Manchester and would be happy to provide recommendations and ideas for venues and themes. Give us a call on 07507 548 607 or email info@floorfillas.com. We were recently treated to a great example of how NOT to plan a corporate event, courtesy of the BBC’s The Apprentice. The episode’s most cringe-worthy moments included some sumo wrestling entertainment, complete with ‘fat suits’ at Team Endeavour’s army-themed event and a spot of tipsy wine tasting at Team Evolve’s school-themed event. If watching that didn’t put you off planning your corporate event entirely, we have some great ideas for planning your next company away day or event in Cheshire or Manchester. An awards ceremony always goes down a treat at corporate events in Manchester. You can theme a whole evening around an awards ceremony, complete with black tie dress code, drinks and canapés, or simply include a small awards ceremony as part of your staff away day. Recognizing your staff for their input is a great way to improve staff morale and motivation. Our video jukebox system is just perfect for this, allowing you to produce an Oscars-style presentation complete with music and photographs of your team members. Check out an example of our awards videos here. Casino themes are also very popular for corporate parties and events. Recreating the glitz and glamour of a Las Vegas casino will be sure to result in an event that your employees will be talking about for weeks and is great for improving team building and staff camaraderie. Check out an example video for a casino-themed event here. The Bond theme is another great idea that goes down a storm at staff parties and makes for a fun and memorable corporate event. Some ideas to include are stunt shows, Bond showgirls and themed music entertainment. You can even hire a Sean Connery or Bond villain lookalike for your event! You can watch an example of one of our James Bond themed Video DJ presentations here. If you’re looking for some more ideas for a unique and entertaining corporate event, or evening entertainment for your staff, please contact us for more inspiration. As well as our Video Jukebox service, which works well for themed events for any occasion, we can organize special lighting, DJ entertainment with music of your choice, backdrops, a custom logo, custom video production and VIP red carpet. Give us a call today on 07507 548 607 or email info@floorfillas.com. P.S. Have you checked out our Facebook page? Like us today for more ideas for events and parties and the opportunity to take part in giveaways and special offers. Entries (RSS) and Comments (RSS). Guides. Sitemap.